William Arnold (Seattle Post-Intelligencer): "Now, here's a surprise: 'The Rundown,' the new action-movie vehicle for the former wrestling champion, The Rock (aka Dwayne Johnson), is quite a bit of fun. In fact, in its own good-natured, silly way, it works better than most of the year's other adventure-gutbusters. [...] it delivers the goods as a mindless Hollywood action movie in a way few of its recent predecessors have, and even non-fans might find it a most diverting guilty pleasure." Roger Ebert: " The moment I heard 'Amazon,' I perked up, because I'm getting tired of action movies shot entirely within Los Angeles County." I love this film. I would never have expected The Rock and Sean William Scott would play off each other so well, but the film works as both an action film and a comedy. This movie is worth watching simply for Christopher Walken doing the Ultimate Christopher Walken-y channeling of Kurtz in Heart of Darkness/Apocalypse Now. It's seriously a tour-de-force of Christopher Walken. And ordinarily I find Scott pretty darn obnoxious, but the pairing with Johnson and Rosario Dawson works really well. The whole flick is really a prime example of a well-crafted turn-off-your-brain-and-hang-on action comedy. I'm not a WWE watcher, so, I guess I'd had an awareness of The Rock from his appearance in The Mummy Returns, but I don't think I've ever gotten around to seeing The Scorpion King. 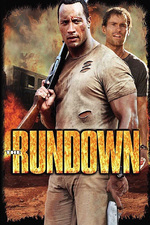 So, The Rundown was the first thing that really showed me how absolutely delightful Dwayne Johnson is. It's a given that he'd be great at the stunts and action. But this showcased his comedic skills, his acting, his general overwhelming charisma. The movie borrows from Midnight Run, and the ending doesn't hold up to hard scrutiny (wouldn't Sean William Scott's father come after them eventually when the hallucinogenic paralytic fruit poison wore off? ), but it's something I'll happily watch again whenever it turns up on cable. The reason Johnson's character brings Scott's character back isn't out of fear or respect, but honour. He made an agreement, he owed a debt and this is him repaying it. I have to think that, knowing what he's capable of, the father is too smart to go after him. Also yes, Dwayne Johnson is great and I will watch him in damn near anything. I prefer him in comedy (Be Cool) to action, but movies like this where he can do both are where he really shines.